" ... a Full Night's Sleep ... " ... that got my interest. This book is definitely geared towards the women in the audience - those of us who do as much as we possibly can, and then a little more. Those of us who are tired, stressed, and feeling less than 100% because our lives just don't flow as smoothly as a Leave it to Beaver episode. This book is for us. 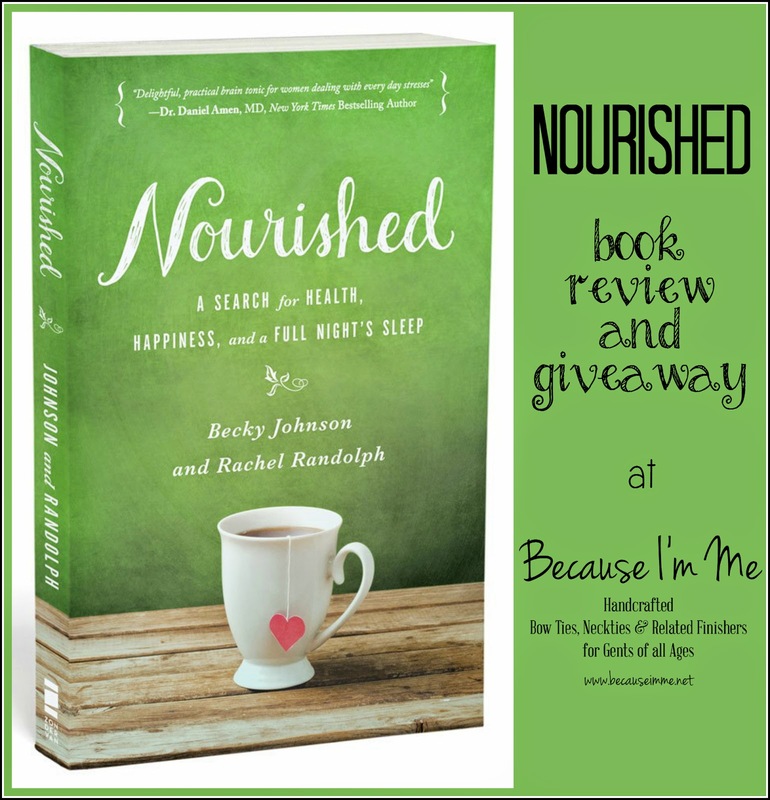 Nourished is written by a mother and daughter team, Becky Johnson and Rachel Randolph. Both women are bloggers, Becky at Laugh, Cry, Cook, and Rachel at The Nourished Mama. While the two are related they have very different points of view in most areas, allowing them to present and conquer different challenges from a variety of angles. As I've mentioned recently and you can see by looking around, this blog is going through some updates and changes. It's a pretty major make-over that will include new logos, new site, new marketing, a shop of my very own (in addition to the Etsy shop, it's not going anywhere! ), new focus ... all in all, a pretty big task for a woman who majored in Marketing when brick-and-mortar businesses were the way of the world and internet based businesses didn't exist. I'm learning a lot but have so far to go. This book, offering a respite from this crazy life, came at a perfect time (though finding moments to read it weren't easy to come by - thank goodness for those rare moments during the school day) and has helped me to stay grounded in the midst of this craziness. The book begins by explaining the problem: we women need to recognize our stressors, and, bit by bit, find ways to make our lives work for us and our families in ways that are more nourishing. The authors list what they feel are women's top ten stressors: chaotic surroundings, too much to do, negative body image, negative self talk, fitness, marriage, friendship, parenting, food issues, and spiritual issues. After listing those stressors the remainder of the book offers suggestions for minimizing personal conflict in those areas, beginning with getting the house in order and ending with spiritual development. I'm kind of a neat-nick when it comes to my house, I don't like clutter at all. With this crew and our schedules we really need order so that chaos doesn't win and I firmly believe that begins with a clean house. Even still, there were things I took away from that particular chapter as I was reminded that I didn't do a deep cleaning when the kids were gone last summer (we were busy laying the wood floors) and am due for one next summer. Each chapter provides valuable suggestions accompanied by Becky and Rachel's "real life" experiences. Just as it's much easier to relate to and learn from a friend's personal experiences the same holds true in this book, there were plenty of "oh, I've been there" moments in the book. A take-away from the book was the idea of "stable misery"; avoiding making radical adjustments for the better because the discomfort and uncertainty of change is more frightening than the current misery we've grown comfortable with. I am not plagued by this, but there are some areas in my life in which I could use a motivating kick in the rear - I don't think we consciously choose to be less than happy, often it doesn't even cross our minds that change is an option (how often do we spend 5 minutes fixing something broken in our homes and wonder why we didn't fix it years ago? Or is that just me?). 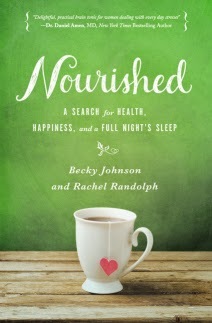 This softcover book, Nourished: A Search for Health, Happiness, and a Full Night's Sleep , is 253 pages long and available at major retailers. More information about the book can be found at Laugh, Cry, Cook and at The Nourished Mama. Enter below to win your copy of this refreshingly delightful book. Good luck! Also - a hot HOT shower. Ahhh. My favorite stress reliever? Prayer, Chatting with a trusted friend, and a back massage from my husband. Probably two things. Biking early in the a.m. on my stationary bike, followed by some stretches/back exercises. I do the bike b/ c it's good for me, but the stretches b/ c they eliminate lower back pain.....and they just feel great. My favorite stress reliever is praying and working out.